I have had a serious love affair with coconut lately. This for me is a big step. Not the love affair with food part, but the coconut part. You see, coconut has never been a favorite of mine, unless it was in Pina Coladas or suntan lotion, that is. I knew that I was hooked. Since then, I have been making many many coconut treats. 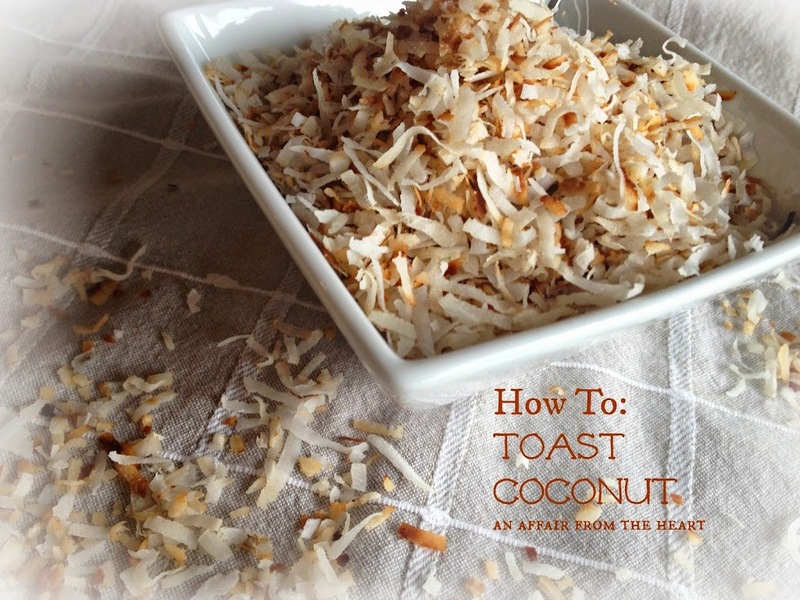 Many recipes called for Toasted Coconut, and as I was toasting some today for an upcoming post, I thought maybe I would do a post on the how to do it. I mean at some point in our life, we didn’t know how, right? There are about 2 cups of sweetened coconut here. There are two ways to go about this, you can either toast it in the oven or on the stove top, which is the way I typically do it. 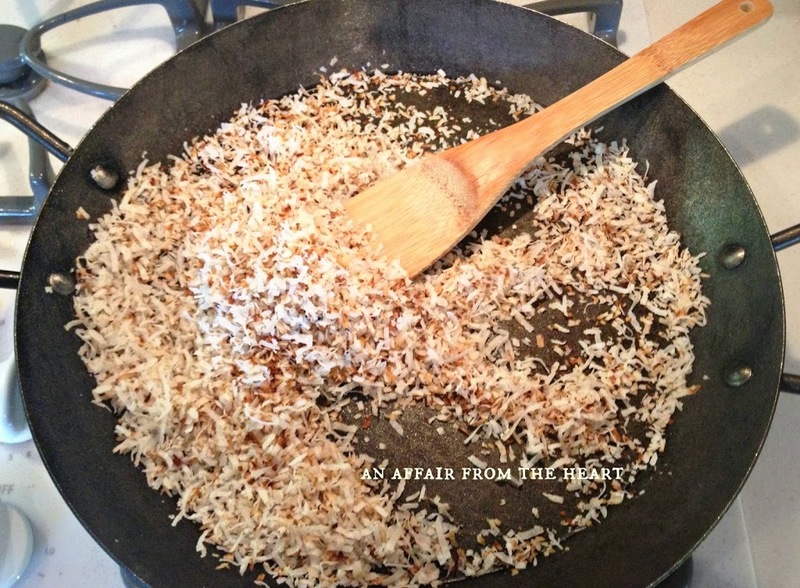 Sprinkle your coconut into a frying pan and spread it out. Over medium heat, brown your coconut, stirring regularly so as not to burn it. It toasts quickly, usually only takes about 5 minutes. When it is golden brown it’s done. 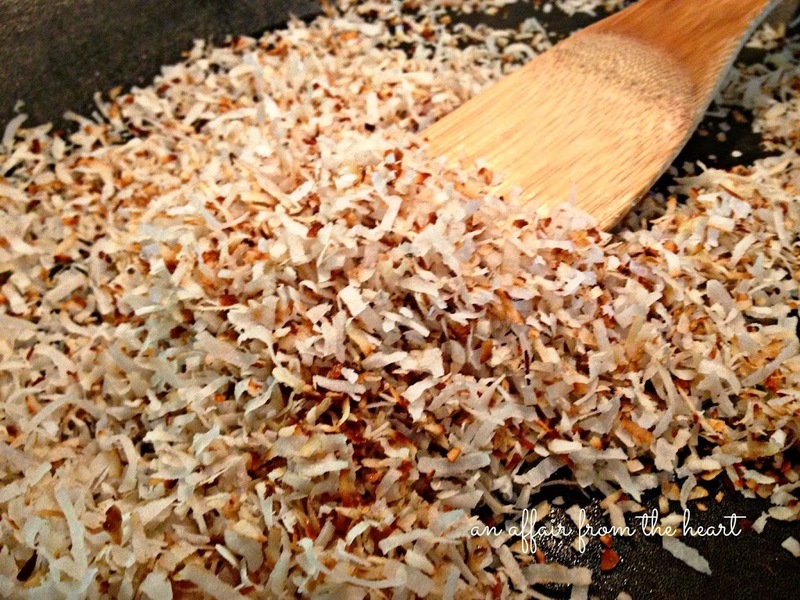 Sprinkle your coconut onto a cookie sheet. Bake for 5-10 minutes, stirring every 3 minutes or so to evenly brown. Make sure you watch it, once it begins to brown it happens very quickly! I think that is why I prefer to do mine on the stove top, I am right there stirring it, I am not as likely to walk away from it. Sweetened coconut will brown much faster. If you have unsweetened coconut on hand, you can sweeten it by tossing the coconut with powdered sugar. Seal left over in an air tight container and store in the pantry for about a month, or freeze for up to one year. Tasty served over ice cream! I will have to try this!!! Have you had one of those coconut ice cream bars? I have had one….. every night for about 2 years!!!!!!!!!!!!!!!! CAN YOU SAY ADDICTIVE?????? This is a great tutorial!! I always keep a bag of toasted coconut in my freezer for emergencies! what? I had no idea how easy this was to do! And warm out of the oven I could barely keep my hands out of it! Making this to go on the German chocolate cake im baking today!